They say that good things come to those who wait. I'm not entirely sure who 'they' are, but they're definitely right when they say that patience pays off. After months of waiting, the new incarnation of the classic knit collaboration between burlesque icon Dita von Teese, and Australia's own luxury heavy weight label Wheels & Dollbaby is now available for pre order! 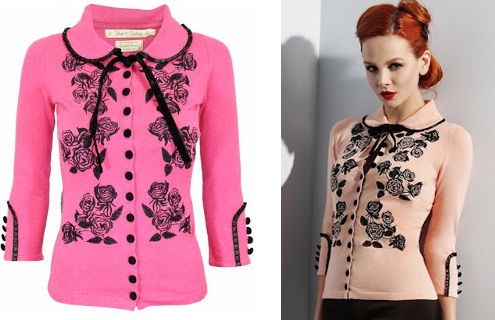 This cardigan screams elegance and femininity. From the delicate floral embroidery and velvet covered buttons, to the sleeve and collar trims and the velvet neck tie, this piece is a must-have for every woman who wants to keep cozy when it cools down, and still look and feel a million dollars. The latest colour ways are all on the warmer side and consist of a delicate baby pink, a fun and flirty coral, and the revival of the ever popular red. 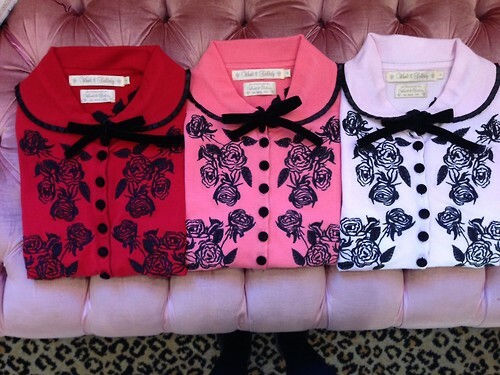 Each colour features the signature black rose embroidery, buttons and trim. Personally, I was quite surprised (and delighted!) with the choice of colour palette. I know that many other Dollbabies were expecting shades of emerald, gold and black, as they would have been a bit more in keeping with the majority of the current range, the opulent Formidable La Femme. While I adore the new colours (I'm a sucker for anything pink), I can understand that some fans may feel a little bit disappointed in them, as they do bear a strong resemblance to editions of years past. I stumbled across a photo on Tumblr the other day that shows the shades a little more true to life, and I too was struck by how similar the colours are to ones we've already seen! Bear in mind that they may look different in person, but until the 30th of May none of us will know for sure. While the red was brought back by popular demand, the coral and the baby pink shades look very much like the hot pink and peach colour ways, released in 2011. I'm still devastated that I missed out on a Hot Pink Dita, so I'm personally over the moon that the coral looks so much like it, and I'll be saving my pennies for sure! Which colour is your favourite? The Dita Cardigan retails at $190 AUD, and you can head over to the Wheels & Dollbaby eBoutique to place your pre order now. It's a really stunning piece, isn't it? I'm so in love with it that if I had the means I would dish out a crazy amount of money on every single colour it comes in, haha! Thank you so much for wandering over to my li'l slice of the internet, I hope you enjoy your stay !